UPDATE (11 Dec 2013): Click here to see more recent research. The problem with having specialists in so many different areas these days is that the whole problem gets neglected. Steve has foot pain. He’s referred to a podiatrist who says, “We need to open up your foot.” Foot pain comes back after surgery because his flat feet are being driven from the top down: an anteriorly rotated inominate, internally rotated hip, knee valgus, and excessive pronation at the feet. But how far can we extend connections like these? Poor “teeth coming together-ness” associated with foot position. If that isn’t cool, I don’t know what is. Rothbart looked at the foot, the hip, and the cranium and drew relationships between them all. The summary is that when you look at a person (more specifically, a young Mexican subject), their more pronated foot is associated with shorter vertical facial dimensions on the same side. Looking at it in more detail, a pronated foot is linked with an anteriorly rotated innominate via the mechanism I mentioned above. It is also associated with an anteriorly rotated ipsilateral temporal bone (think bringing the mastoid process up and making it less palpable, a.k.a. counterclockwise rotation in the photo below). 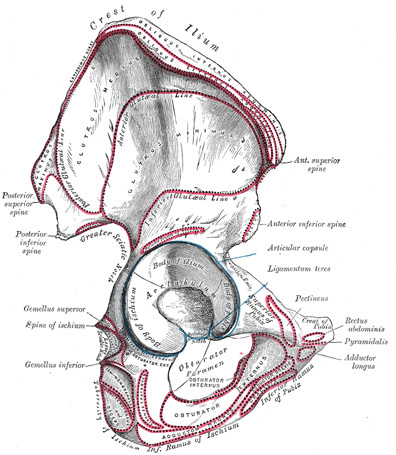 The sphenoid is pulled downward, and the maxilla is pushed upward. There we have it: short face! There’s a helpful radiograph in the article linked above. Pelvic bones and temporal bones look pretty similar, don’t they? He briefly mentions a fix for malocclusions. Check out the video below for an introduction to Advanced Lightwire Functionals. The DO lady in that video mentioned using the ALF to treat people with autonomic problems. The central goal of the Postural Restoration Institute – as I understand it – is to get at the nervous system. We want the body to have sufficient variability to do what it wants to do. We don’t want to be stuck on our right leg. We don’t want to be stuck in extension. We don’t want to be sympathetically toned up. Realigning your temporal bones, innominates, and feet are just neutrality acting on the nervous system. Consider another article from Rothbart (2011) where he describes a foot condition. On a side note, does anyone have a problem with him naming this condition after himself? In people with Rothbarts foot, the first ray (that is, metatarsal up through big toe) hovers over the ground even when the talus is neutral. The big toe can’t feel anything underneath it, so when walking, the foot pronates hard to “find the floor”. These videos on rearfoot varus and forefoot varus can help you picture it. The neurophysiological model which Rothbart proposes helps explain why proprioceptive insoles can make people better. Contrary to traditional orthotics that offer support, these insoles simply give the foot something to feel. Rapid pronation every time your heel strikes the ground holds the body in a state of extension. Good input on the bottom of the foot sent up to the cerebellum helps keep the person’s system neutral. And as we already talked about, this can help a lot of things. From feet, to hips, to teeth! Make sure you step back and look at the whole person when you’re helping them; getting too focal traps you into the specialist mindset. Better to be the person who sees everything than the person who misses the big picture. Rothbart, B. A. (2011). Primus Metatarsus Supinatus (Rothbarts Foot): A common cause of musculoskeletal pain – Biomechanical vs Neurophysiological Model. Podiatry Review, 68(4), 16–18. That’s very cool, Lis! So can you speak to the efficacy of it at all? Care to shed some light? altered using dental orthotics, prescriptive insoles, or both concurrently. TMJ dysfunction, a PreClinical Clubfoot Deformity and a Class II Sacral Occipital Subluxation. Each patient had a series of 4 cranial radiographs taken using a modified orthogonal protocol. The first cranial radiograph was taken with the patient using neither the dental orthotic nor proprioceptive insoles were used (baseline measurement). The second cranial radiograph was taken with the patient using only the dental orthotic. The third cranial radiograph was taken with the patient only using the proprioceptive insoles. The final cranial radiograph was taken with the patient using both the dental orthotic and proprioceptive insoles concurrently. The degree of change in angle between the various specified cranial landmarks and atlas were measured directly off of these radiographs and compared to one another. plane shift was noted when using only the prescriptive proprioceptive insoles. In the third patient, the frontal plane position of the cranial bones and atlas increased (away from orthogonal) when using the generic proprioceptive insoles alone or in combination with a prescriptive dental orthotic. position of the cranial bones and atlas. This study demonstrates that changes in the frontal plane position of the cranial and atlas bones can occur when using proprioceptive insoles and/or dental orthotics. This is very cool stuff. Can’t wait to read the whole study. It would be great to see what the data shows with more subjects. I’d be curious to hear why you think the third patient didn’t see progress towards some sort of “neutrality” in the frontal plane? Rothbart BA 2013. Prescriptive Insoles and Dental Orthotics Change the Frontal Plane Position of the Atlas (C1), Mastoid, Malar, Temporal and Sphenoid Bones: A Preliminary Study. Journal of Cranio Manidibular and Sleep Practice, Vol 31(4):300-308.